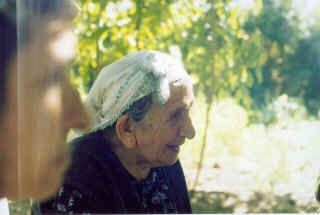 Thanks a lot to Kheiree Akdogan ( My Grandmother ) because of Her kindfull efforts. 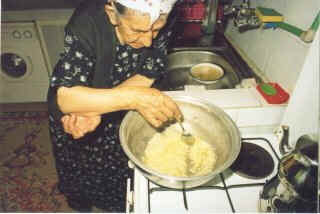 I always tell my Mom that She couldnt yet cook anything like my Grandmother .Thats really true . 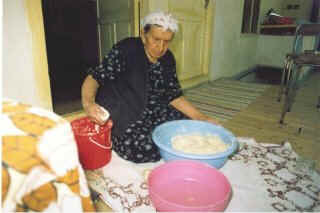 I have been tasting the Noxcy foods for many years and couldnt find one who can cook our foods better than my Grandmother . I bet everybodies Grandmother are like all the same . They are all sweet and kind . Thank to all Grandmothers because they are with us . 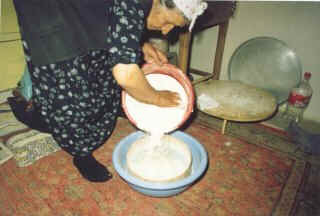 For one We , Chechen's call this Djepelg and for all its Djepelgesh (plural for of it) . There are types of Djepelgesh . 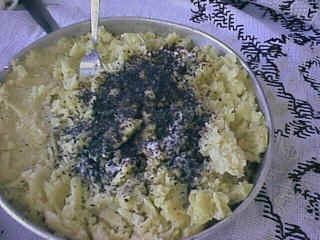 You can put potato(Kertol in Chechen language) or beerem ( smashed chesee without salt in it) in to the Djepelgesh . You can also put the butter much or less in order to your kind of taste . 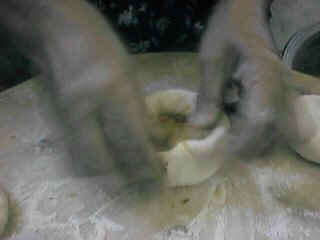 Here I am going to present the Potato inside Djepelgesh but the steps for the Beerem inside Djepelgesh is the same . 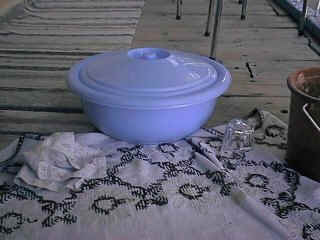 We start with boiling the potatos .We use 1,5 - 2,0 kgs of potatos . After boiling is done ( when its boiled enough to smash it by a fork ) slice off the potatos skin then smash them with a fork inside a wide dish . 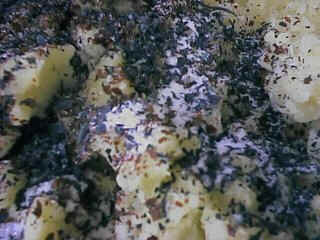 after smashing the potatos as seen in the pictures put some spice , red pepper , basil( its reihan in Turkish . 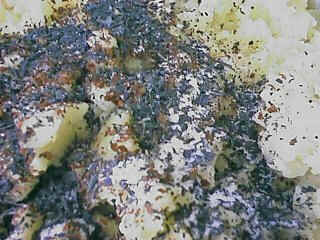 Its a purple colored , smelly spice and can be seen in the pictures ) and some salt , in to the smashed potato . The amount of the spice should be adjusted according to our taste . 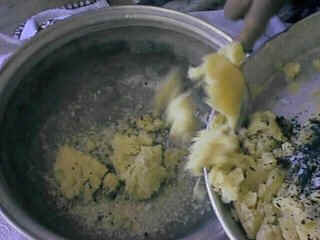 then we are going to mix the spice in to the potato again by the help of fork or hand . then with 2 spoon full of butter cook the tiny sliced 1 or 2 ( each 200 gr ) onions until they get pinky like showen in the picture . Of course my Grandmother wasnt alone while doing all this stuff . 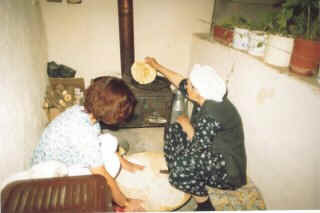 My assistant (sister) Syrill and Grandmothers Bride (Inanch) were helping my Grandmother . after the sliced onions get pinky put the potato and spice mixture in to the onion cup . Then mix them too . 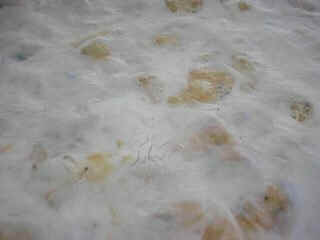 While mixing the latest mixture becareful about the potato . It should be smashed well . 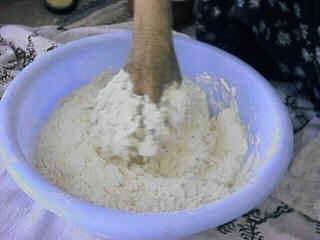 then we should prepare the dough . 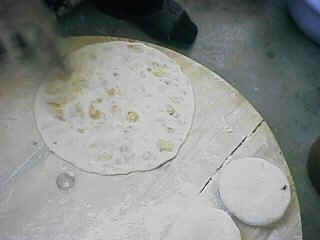 The dough we are going to prepare is the same with the dough in the bakery to cook bread . It will be fermented dough . We should put the instant dry ferment(10gr) and 1 full spoon salt in to the flour(~2kgs) that we are going to prepare the dough with . 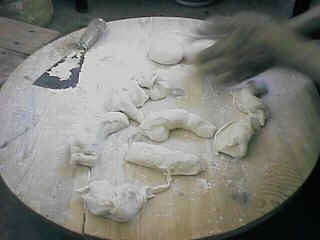 Then we can start preparing the dough like showen in pictures . 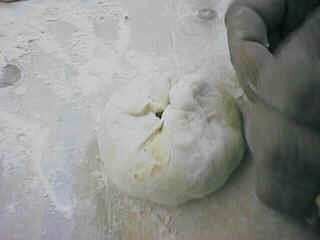 The thickness of the dough should be like a chewing gum . 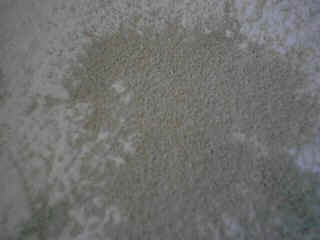 We have to wait for the dough to get fully fermented for 30 minutes alone after its done . From nowon , I think the pictures can easly describe the steps . 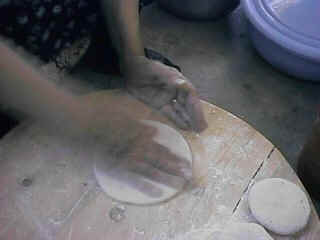 The dough is sliced in to peaces that one can hold in his hand . 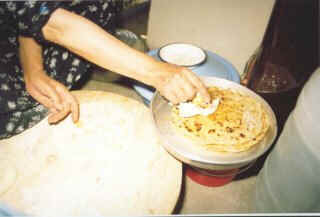 If the parts of dough sliced are too big then the Djepelg will be a big one . 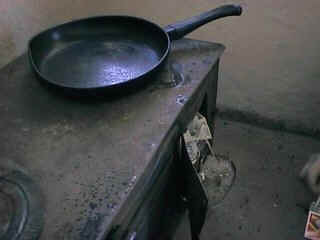 This should be adjusted according to the pan that we are going to cook the Djepelgesh in it . 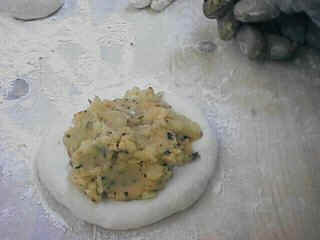 Put some amount of mixture into the piece of sliced dough as shown in the pictures after flatting the dough piece some . 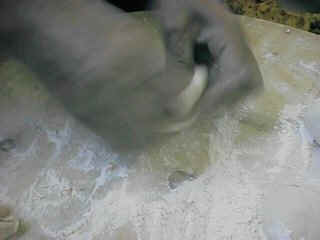 Then we close the dough piece like in the pictures . 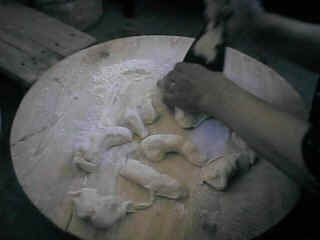 We have to close the dough fully . 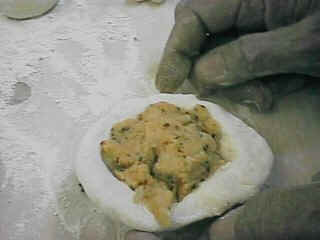 After closing the dough piece we are going to open (flatten) the mixtured dough piece like in the picture in enough size to cook it in our pan . 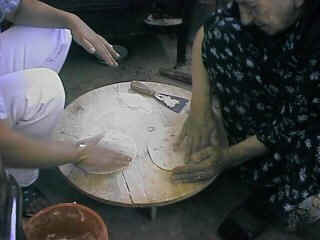 the style to flatten the mixtured dough piece is shown in the pictures . It should be done with patience and hand care. 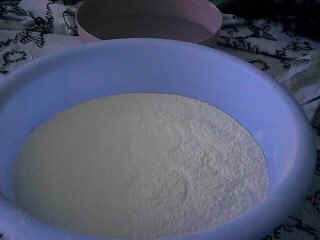 Otherwise the mixture may get out through the dough . 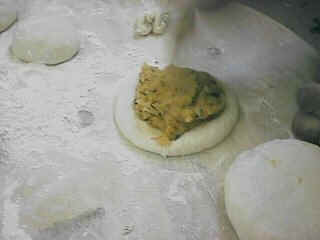 after flattened the mixtured dough piece we can put it into the pan to cook . 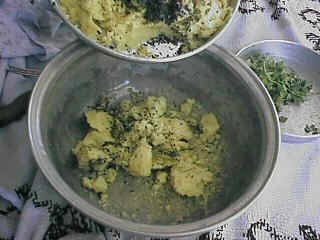 We should cook it until it gets the form in the picture below by turning to both sides periodically . 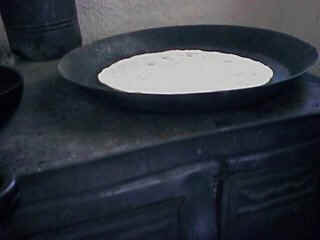 Two sides of the Djepelg must be cooked at the same time . 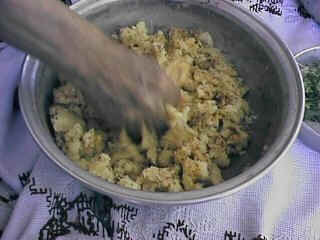 Lastly , while putting the Djepelgesh in to the serving dish from the pan we should slide the butter on each Djepelg taken out from the pan after its cooked . 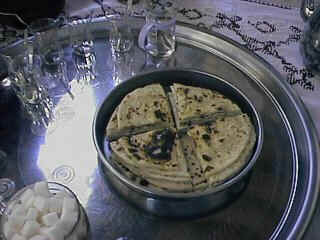 Lastly you can slice the Djepelgesh like in the picture before eating it . There is nothing much to tell about Djepelgesh . 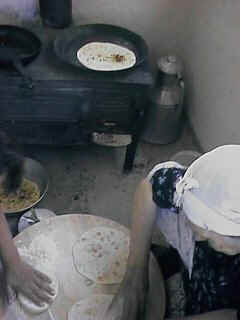 Its delicious and easy to cook Chechen food . You can eat it much buttered . I like when its buttered much . It should be eaten when its hot . 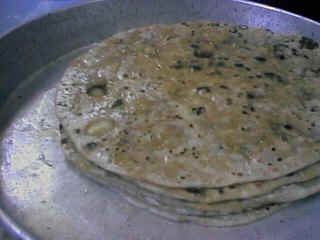 Its good also with tea . 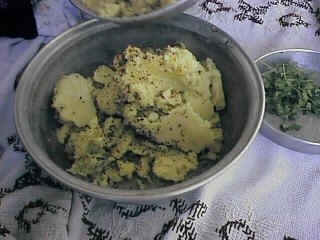 wish you to eat Djepelgesh with a good appetite ...!